AFL Telecommunications offers a variety of Fiber Holder to enhance your fusion splicing efficiency. Fiber holder are available in 2, 4, 5, 8, 10, and 12 fibers capacities for ribbon-fiber arrangements. 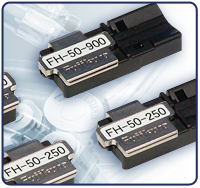 Singe-fiber holders are available for both 250µm coated fiber and 900µm jacketed pigtails.